Trace the current owner of a CR93. I would like to trace the current owner of a CR93 that I owned and raced in the UK in the late 60s. I owned and raced a CR93 in the UK in the late 1960's. 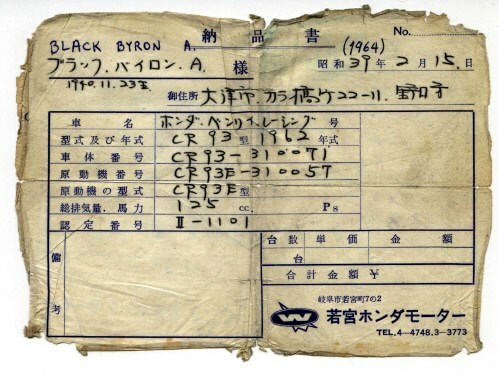 I bought the bike from an American rider called Byron Black in 1966. Byron got the bike from Japan in 1964 I think it was originally a 1962 model, one of the road bikes with a race kit. I competed in club and national races in England best place being 3rd in a final at Cadwell Park in 1997. Financial problems forced me to sell the bike, I think it was Chas Mortimer that got the bike from me, he went on to be British 125 Champion in 1968, and then raced in the TT with great success during the 1970's. I have attached a bill of sale when the bike was sold to Byron Black, also a photo of me in my first race on the Honda. I believe this bike is now in Japan, it would be great to find the owner and pass on some of the history that should really belong to the bike.